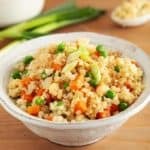 This Egg Fried Rice is made with cauliflower rice and is zero SmartPoints per serving on Weight Watchers Freestyle Plan. Prepare the cauliflower by pulsing florets of cauliflower in a food processor until they resemble small grains of rice. Alternatively, defrost some pre-prepared cauliflower rice. Heat the oil in a large non stick skillet / frying pan over a medium heat. Add the onion and carrot and saute until the have softened (5 minutes or so). Add the cauliflower rice and peas and stir for a couple of minutes. You want the cauliflower to be cooked but you don't want it to cook too much and turn mushy. Make a well in the middle of the rice and crack in two eggs. Stir the eggs gently into the rice until the eggs have cooked. Drizzle the light soy sauce over the top. Serve the rice topped with sliced spring onion if using.